1990 was a pivotal year for pro-wrestling, the site of an intriguing meeting of many of the 80s styles and personalities that characterized that decade, as well as some of the fresh young talent and developing styles that would dominate the 1990s. The Japanese landscape was, in 1990, witnessing rapid change with the rise to prominence of some of the country's biggest stars of the ensuing 15 plus years, the genesis of several companies, and the collapse of others in the span of but a few years. Keiichi Yamada, in 1989, had become Jushin Liger; Toshiaki Kawada garnered footing in All Japan in the late 80s as a member of Tenryu Revolution, and former sumo star, Akira Taue, had made his debut in 1988 – as had Kenta Kobashi. Mutoh had made his return to Japan and within a year became one of the hottest stars in the country alongside Hashimoto and Chono. 1990 also saw a reshuffling of Japan's promotional scene with the formation of FMW a year prior and the death of the UWF only to be revived as UWFi in '91 – breakaway promotions such as Super World of Sport (Genichiro Tenryu) and RINGS (Akira Maeda) would also form in 1990 (SWS), or but a couple of years later in the case of RINGS. All Japan though, unlike New Japan, was placed in a difficult position in 1990, as following the 1989 culmination of one of the most legendary career rivalries in the history of the company, Tsuruta versus Tenryu, with one of the better matches of that decade, Tenryu parted ways with the company. His departure took place under bizarre circumstances, as he was contracted to an optical technologies company, as an "ambassador" for their brand, which so happened to found a pro-wrestling promotion in Super World of Sports a few months later. All Japan, following the loss of one of its top stars still possessed major talent, but top calibre Japanese stars. Whilst Stan Hansen, Steve Williams, and Terry Gordy stood as star gaijin talent, and Fuyuki, Kikuchi, Yatsu, Kawada, Kabuki, Fuchi, Tiger Mask II and Saito composed the heart of a strong midcard, Jumbo stood as the only true native main event star in AJPW, and he had been a member of the company's upper echelon for years. Perhaps in another era this lack of talent wouldn't have been an issue of the utmost importance, as prior to Fujinami/Choshu and many of the Japan versus Japan feuds that followed in NJPW, few if any in either company were Japan on Japan. In All Japan specifically, however, if this mentality hadn't changed before the Tenryu/Tsuruta feud, it certainly had after. With a distinct lack of native headliners, Baba was forced to create new stars – fan devotion, no matter how strong, could only last so long. Tenryu's last match for Giant Baba's All Japan took place during the final night of the 1990 Champion Carnival, where Tsuruta defeated him on the way out in their final singles match. Baba didn't introduce his new singles star that night, but only a month later on the opening night of the May tour, Tiger Mask II, Mitsuharu Misawa, called for his partner, Toshiaki Kawada, to unmask him during a heated tag match against Fuyuki and Yatsu. The reaction was hot, without a doubt, but mild in comparison to the insanity that would befall Tokyo by early-June, as Misawa challenged his childhood hero, Jumbo Tsuruta, to a singles match in the post-match, after the pair had teamed sporadically earlier in the year. Two matches into his post-Tiger Mask career, Misawa and Kobashi won the working man's All Asian Tag Titles off of Davey Boy Smith and Johnny Smith. For the remainder of that tour and the next Misawa was paired with fellow young stars in different combinations mostly in tag and trios matches opposite members of Tsuruta's stable, Jumbo's Army. The new generation won most of these six-mans, which called for the introduction of Jumbo himself into the fray, the company's biggest Japanese star, at which point matters escalated dramatically. In the third trios match involving Tsuruta, a bout at Korakuen Hall on May 26th Misawa, Kobashi & Taue beat Fuchi, Great Kabuki, and Jumbo Tsuruta in a bout that changed the tone of the build to Budokan dramatically. Tsuruta attempted to bully the younger side mid-match, knocking Misawa's allies off of the apron unprovoked. This riled Misawa up, and in a masterful piece of storytelling, Misawa delivered a stiff elbow to Tsuruta minutes later after Jumbo tapped him on the shoulder, standing on the apron. Whilst this would have sufficed as far as story progression was concerned, they escalated the intensity considerably with Tsuruta selling the elbow on the floor as if he had drifted into unconsciousness. So believable was Tsuruta's selling that the majority of those in attendance rose, ignoring the in-ring action completely, attempting to evaluate Jumbo's condition on the floor. When Tsuruta finally awoke minutes later, Misawa was the first thought on his mind. The pair brawled in-ring leading to a pull-apart from respective teammates whilst the match was still underway. Misawa inevitably pinned Fuchi with a bridging Tiger Suplex, which served to build to further trios matches of a similar ilk on the tour, as well as Baba's ultimate goal for the next tour – the Misawa/Tsuruta singles match at Budokan, the first show at that hallowed venue since the departure of Tenryu in April. These heated trios matches, coupled with the Tiger Mask II unmasking itself catapulted Misawa from popular young star, to the precipice of super stardom. Misawa versus Tsuruta, a non-title match after Tsuruta dropped the Triple Crown to Gordy, was booked for June 8th of 1990. There is a now fairly well known story about the backstage happenings before the famed encounter and has been recounted a number of times by Dave Meltzer, who was in attendance that night. It is said that Baba made the decision to put Misawa over on the day of the show, after hearing chants of "Misawa" outside the venue, during the tour, as well as before the show, and witnessing an explosion in the sale of Misawa merchandise. When a messenger was sent from Baba to Jumbo notifying Tsuruta that he would be losing later on, a startled Jumbo sent the runner back asking if he could lose via disqualification – Baba response was a simple "no". 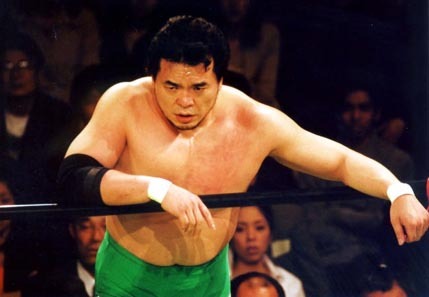 On the night of June 8th fans chanted Misawa's name during intermediary portions of the show, before his entrance, and most furiously during his encounter with childhood hero, Jumbo Tsuruta. Misawa's entrance in the show's main event ahead of a Gordy/Hansen Triple Crown match, was the standard All Japan walk-out through the crowd, to an infectious theme music. It is then strange to think that more so than any entrance in ECW, Flair at WrestleMania 24, Kobashi at the Tokyo Dome, or even Punk at Money in the Bank 2011, Misawa's on this night in 1990 stands as the very best I have seen. The only entrance that approached this in my eyes was Kobashi's prior to his retirement match in 2013. At first this may seem a deliberately contrarian opinion, as Misawa had subsequent Tokyo Dome entrances that were in every way more extravagant. But, to a pre-teen popping in his first puro DVD – seeing Misawa's stoic face gazing off camera before being escorted through a rabid crowd by fellow young stars and future legends, Kawada and Kobashi, all to go to war during the biggest moment of his career – no entrance could have been as grand, and few circumstances so emotive. As rabid as Budokan was for Misawa, they still loved Tsuruta, yet despite this, Tsuruta as the veteran overdog imposing his will on the young, high-flying and hard-hitting Misawa was a magical dynamic. Although Misawa and Tsuruta, even at this early stage, had kindled a burning rivalry, the match with respect to the second was far less vitriolic. Misawa, only a month or so into his heavyweight run, and still very light and agile, utilised many of his Tiger Mask moves and standard dives whilst still engaging Tsuruta in tests of strength, and delivering hard elbows that would become a career staple. Whilst the animosity had been toned down several degrees from the incident at Korakuen, reference to the knockout spot in the initial six-man was made not only throughout the first match, but in the remainder of the pair's encounters. Tsuruta, in most future matches with Misawa in the 1990/1991 period sold damage to his head after the majority of the strong head-shots – in some instances he would even go as far as to slap himself in the face in an effort to preserve consciousness. The first Tsuruta match is undoubtedly the most famous and widely praised of the rivalry, but it did not spell the end of the programme, but rather served as a catalyst for the generation of a catalogue of classic matches, each with its own unique merits. The war between the younger generation and Jumbo's Army only grew in intensity from the finish of the first Misawa-Tsuruta singles match, although escalated to a roaring climax once Akira Taue joined Tsuruta's stable ahead of Misawa and Tsuruta's anticipated rematch for the Triple Crown number one contendership. The match was held on September 1st of the same year, once again at Budokan Hall, and on a technical level matched and perhaps even exceeded the original. Both Misawa and Tsuruta were more aggressive digging into one another with slaps, as well as much of the same offence showcased in their first encounter. Budokan roared throughout, and whilst the first match has certain intangible assets that place it confidently ahead of the second, the September bout is a classic in its own right, one that several prefer over the first. Following the defection of Taue and the September Misawa-Tsuruta match, was a series of tag team and trios matches pitting Taue against his former team mates, as a new member of the otherwise veteran-centric stable. One such match producing an interesting dynamic was a Taue & Tsuruta versus Kawada & Misawa tag from December 7th, once more at Budokan Hall. Their late 1990 tag match followed from a draw in September at Korakuen Hall, and was too worthy of classic status. A dynamic that proved particularly interesting was that, despite taking place in a Misawa stronghold, Tokyo, the Budokan crowd on the night of the 7th was heavily pro-Tsuruta. Much like in the initial Misawa-Tsuruta singles encounter, the crowd cheered both teams, but any interference on the part of the Misawa side was met with heavy boos, whilst similar acts from the Tsuruta team were greeted with thunderous applause. Whether the match was laid out spot for spot, as many of Kobashi's legendary tags were in the coming years, or had elements that were called in the ring, I am not at all sure. However, the match itself was worked according to the heavy Tsuruta-bias, with well-timed break-ups from both sides. Even with their heavy Jumbo affinity, the victory of the Misawa team was met with resounding applause, such is the nature of Japanese pro-wrestling, and matches of an extraordinary high calibre. In the months that followed Jumbo and Misawa's respective armies fought in tags, singles, and trios, although the battles that yielded the ripest fruit were the trios outings in late 1990 and early 1991. Of particular importance was the October 19th six-man, but, although it is highly regarded, and rightfully as brilliant example of trios wrestling – the April 20th variant from Korakuen, improved on its October predecessor in every conceivable way. Few other trios matches that I have seen have captured the same sense of comradery and mutual hate as the Misawa-Tsuruta gang-wars, and fewer still were of the calibre of the April 20th match. If the October outing was a shining example of trios wrestling then the April 20th match, by comparison alone, could be considered as pinnacle point. The bastion of the old guard with Taue at their side against the new generation at Korakuen is a complete, psychologically speaking, tag match in most every sense, and is thus a classic in much the same way as the latter Holy Demon Army matches were. Tsuruta and Misawa never saw a definitive conclusion to their rivalry. They battled sporadically through to 1992, at which point Tsuruta fell from the main event picture due to a diagnosis of Hepatitis B. Misawa would go on, in that same year, to win his first Triple Crown, cementing his status as All Japan's ace, as he, along with Kawada and Kobashi, the so called "Holy Trinity", would produce some of the best matches in the history of Japan, often alongside contemporary, Akira Taue. The real life interplay between the careers of Misawa and Tsuruta would feature a vital interaction once more at the end of the decade when Tsuruta recommended to Giant Baba's widow, Motoko Baba, the Dragon Lady, that Misawa be made president of the company given the respect he had from the locker room, as well as his years of continued drawing success and in-ring delivery. Baba obliged before letting Tsuruta go as an office employee, a violation of traditional ethics that may have very well added to Misawa's desire to split from All Japan and form Pro-Wrestling NOAH, largely to escape the clutches of the Dragon Lady. Regardless of Tsuruta's indirect contribution to the formation of Pro-Wrestling NOAH, his greatest achievement, as it relates to Misawa and the legacy of All Japan, is the fact that he was able to help Misawa get over to such a large degree. Misawa connected with the audience due to Baba's booking, extraordinary ability, and timing, but it was Tsuruta, through his legendary matches that helped solidify Misawa as the company's new top Japanese star – a vital contribution to All Japan's legacy. What has me look back at this already monumental and historically significant feud in Japanese pro-wrestling history with further reverence, was the style in which it was worked in comparison to the even more widely regarded wars of later years. There is a certain implicit beauty in the absence of head-drops and no-selling that aided later All Japan matches reach their heights. The Misawa-Tsuruta Wars were built on firm puroresu logical foundations, and sound booking with little need for physical degradation to the degree of later series such as Misawa-Kawada, Misawa-Kobashi, and so on. It is in this way that the Misawa-Tsuruta Wars look even better in the eye of hindsight as apart from holding up from a pure wrestling and story-telling standpoint, this war, inevitably left a far lesser mark on its participants than the head-dropping spectacles that would follow in the coming years.